Now, I’m not a big fan of the Bond franchise. My interest in the franchise was piqued by Daniel Craig’s casting as Bond, James Bond. I absolutely loved Casino Royale (apart from the extended finale). I can’t say for certain that QoS is the worst Bond film ever. But on almost every level, from plot to character to action, QoS is a disaster. What’s the plot about? Well, Bond’s still in revenge mode after the events of Casino Royale. But he stumbles upon QUANTUM, a mysterious cabal intent on…doing something with the world’s water supply. Don’t ask me what they want to do with the supply…make lots of money? But how? I’m still not sure, and I’ve seen the film a few times. On paper, the plot sounds simple, and the running time suits a streamlined plot. But instead, the film is stuffed to the brim with action scenes as incomprehensible as the plot. You’re thrown straight into a bewildering car chase scene at the beginning. The constant cuts here make the Taken films looks like exercises in long takes. I’ve re-watched this scene plenty of times to try to understand what’s happening. But it seems like a bundles of different car chases stitched together with all the grace of arthritic fingers. The same can be said for all of the other action scenes (oh, there are far too many action scenes as well). It’s almost as if the director isn’t suited to directing action scenes…and Marc Foster clearly is not. 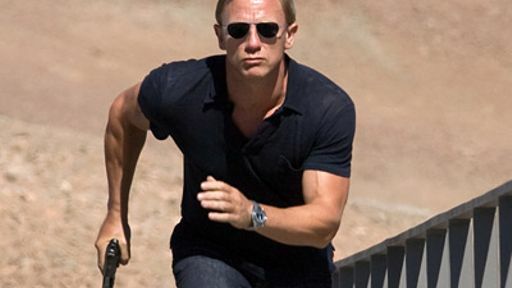 Here’s a picture of Daniel Craig running. We are introduced to old (well, from Casino Royale!) and new characters, but none of them make an impact. Any Bond girl following in the shoes of Vesper would be in a difficult spot, but Camille is utterly, utterly bland. I had to Google her name (and the name of the villain and almost everyone else in this film!). The main villain, Dominic Greene, is almost as poor as the plot. He exudes no menace. He seems written to merely make sure the film has a central villain, rather than be a true opponent to Bond. Like everything else, he’s the victim of a rushed, undercooked script that has no idea where it’s going or where it even wants to go. It’s merely a prop to get from one frantically edited action scene to the next. Even with an incomprehenisible plot, great action scenes would lift the film. But there are no great action scenes. In particular, the climax is very underwhelming. True, the film does look great (when you can follow what’s occurring). And, in light of both Skyfall and SPECTRE falling into the same old, tried and tested Bond tropes, QoS is rather refreshing in its brutal realism. Oh, and Craig looks a hell of a lot more interested in QoS than he did in SPECTRE. But it’s still the worst out of the Craig era of Bond films. VERDICT: 3/10. Quantum of Solace is an absolute mess of a film in almost every sense with few redeeming features. 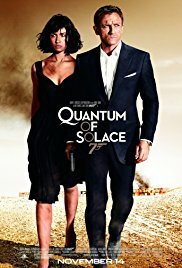 What did you think of Quantum of Solace (2008)? Leave your thoughts/comments below! Previous Article What’s Wrong With Star Wars Fans? I would definitely rate this one as the worst Bond (Craig) movie, because Spectre is at least mildly watchable, and I can get through the first one without falling asleep. I thoroughly enjoyed Skyfall, though, which was actually almost fun! Is Skyfall your favourite Daniel Craig Bond film? Yep! And even manages to make it into the top ten of all Bond movies actually!